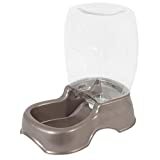 Responsible pet owners buy the best dog water fountain bowl for their beloved pets because these are essential for their good health. Keep in mind that a balanced diet includes both healthy dog food and sufficient hydration, particularly fresh water. This is because drinking water is crucial for the proper functioning of your dog’s body, from carrying and moving nutrients in and out of the cells to maintaining normal body temperature. Without it, your pet can suffer from dehydration and, when left untreated, die. 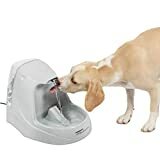 Therfore, we have chosen 10 of the best water fountains for dogs, which can also be used for cats. PetSafe Drinkwell Original Dog and Cat Water Fountain with Bonus 50 oz. Reservoir, 100 oz. 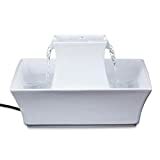 This is a 100-ounce pet water fountain with a free-falling stream design, so it’s suitable for pets of all sizes, from Chihuahuas to Labradors. With its free-flowing stream of water, dogs are encouraged to drink from it instead of from the toilet while its carbon water filter keeps the water fresh and clean. Even the freshest and cleanest water will be of little to no use if dogs with mobility issues cannot reach it. The Drinkwell Multi-Tier water fountain takes care of the problem with its elevated design, a convenient feature for pets with arthritis or for older pets. The receiving ramp is also a thoughtful feature since it reduces water overflow and noise, thus, its quiet operation. The low-voltage submersible pump isn’t just energy-efficient, it’s also quiet so much so that your pet will not be bothered by it. The plastic is also safe, thanks to its no-BPA composition, and easy to clean – just place it in the dishwasher, and it will be clean. There are even cleaning tools that come with it! The Dogit drinking fountain is among the best choices for pet owners with multiple pets, partly thanks to its 200-ounce water capacity. There’s less need for refills during the day, too, so you can be out for most of the day without worrying about your dogs becoming thirsty in the meantime. The continuous free-flowing water provides two main benefits: first, your dogs are more likely to drink from it than from a stagnant pool of water in a bowl; and second, your dogs will always have access to fresh and clean water. Both are important because sufficient hydration means better health for your pets. Like all excellent dog water fountains, it also has a multi-stage filtration system that ensures all unwanted objects are removed from the water. The system removes food, hair, and soil, among other possible debris, which comes from the environment and pets so that there’s always clean water for your pets. Even the relatively larger water-to-air surface contributes to the filtration by maximizing oxygenation and cooling the water. The PetSafe brand is well-known for the reliability and durability of its pet-related products, and its Drinkwell Big Dog Fountain isn’t an exception. 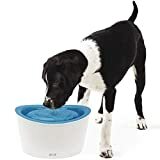 With its 1-gallon reservoir capacity and 5-inch deep bowl, it’s an excellent choice for large dogs or several pets, even for cats. The principles of aeration and filtration are equally crucial in delivering fresh and clean drinking water for your dogs. The free-falling design ensures maximum oxygenation while the activated carbon filter removes unwanted debris, from leftover food and hair to dirt and dust. The result: Your pets will enjoy the cooling effects of fresh and clean water even when you’re nowhere near them. The constant circulation – think of an actual drinking fountain for humans but in a smaller size – minimizes the risk of bacterial growth. But regular cleaning is still a must, but it’s easy due to the plastic components being dishwasher-friendly. Otherwise, the bacteria may still thrive, and we know its adverse effects, especially in terms of illnesses. Other features that we like are the snap-on lid, adjustable flow control lever for controlling the amount of water flow, and the pet-safe cord cover. The 70-ounce water capacity of the Pagoda fountain may be too small for many people, but it’s just right for pet lovers with smaller dogs and traveling purposes. The smaller size isn’t a handicap, too, regarding providing safe and fresh drinking water for dogs of most sizes. The ceramic material isn’t just elegant; it’s also durable so the water fountain will likely last for a few years. The small yet powerful pump recirculates water while the two-stage filtration system ensures that it’s always fresh, clean and safe. The combination means that the water constantly flows in and out of the spout and into the basin so your pets will be encouraged to drink from it. The filtered water doesn’t even have bad tastes and odor even when several dogs are drinking from the fountain, thanks to the activated carbon filter. The moving water doesn’t collect bacteria, too, although there’s always the need for regular cleaning of the dishwasher-friendly, BPA-free plastic parts. The activated carbon fiber, a replaceable part, absorbs the contaminants and chlorine in water while also keeping its taste as fresh as possible. The 1-gallon capacity of the Drinkwell 360 water fountain is convenient for pet parents with several pets, especially when they are out several hours a day. There’s less need to refill the reservoir during the day for this reason. 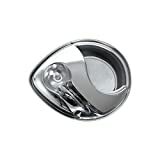 Unlike many pet water fountains, the Drinkwell 360 has five interchangeable spout rings so that there are several individual streams. More pets can then drink from it that, in turn, can encourage socialization among them – a good thing for any pet parent. The free-falling streams of water also mean that there’s maximum oxygenation resulting in fresh-tasting water. But safety is still the most important aspect of a pet fountain, and the Drinkwell 360 delivers it in two ways. First, the activated carbon filter removes bacteria, contaminants, and chlorine from the water while the foam filter prevents unwanted debris from entering the pump. This means even humans can safely drink from the fountain although it isn’t recommended. Other convenient features include a submersible pump, low-voltage power system with in-line plug, and clips for holding the power cord and housing safely. The Petmate waterer works by using the force of gravity in replenishing the water supply in the reservoir. While it may not be as fancy as the other fountains in the list, it’s among the most practical in terms of value – its benefits outweigh its costs significantly. As with most pet waterers with automatic gravity design, the Petmate waterer has a water hopper that automatically pours waters into the water reservoir when its levels get below the low water line. You just have to ensure that the water hopper is filled with water and the waterer does all the work, so to speak, in ensuring that your pets are sufficiently hydrated for the day. You can leave them for a few hours with the knowledge that they have easy access to safe drinking water. The waterer is also designed with ease of cleaning in mind, mainly through the large mouth bottle opening. The feeder is also relatively easy to maneuver even in a tight space due to the large cutouts. The recessed handles aren’t just for design since these make lifting the waterer fast and easy, even for a child. Just be sure not to lift it when it’s full to the brim. You will likely find that a 3-gallon water tank isn’t as light as it appears at first glance. Many pet parents prefer stainless steel pet water fountains because it’s a sturdy and strong material in comparison with plastic. The Pioneer Pet Raindrop fountain is one such product, and it comes highly recommended, too. The fountain is made of premium stainless steel, a material known for its high resistance against cracks, corrosion, and dents, so it’s among the most durable on our list. The matte surface is also easy to clean while the entire unit is also easy to assemble and disassemble, whether it’s for cleaning or traveling purposes. Even small scratches don’t take away from its overall beauty. But the best dog water fountains are judged by their filtration and circulation systems – and the Pioneer fountain delivers! The electric pump ensures that the water is kept circulating, thus, resulting in fresh water. The activated charcoal filter removes most of the contaminants, from hair to dirt, in the water for clean water every time; be sure to replace the filters every 30 days or so for optimum results. Bacterial growth is a major concern among pet owners because of its wide range of adverse health effects. In many cases, the use of multi-stage filtration system reduces the risk of bacterial growth in pet-suitable waterers and fountains. But the Petmate Replendish takes it to another level with the addition of Microban, a system designed to aid in the prevention of bacterial growth. The waterer also uses gravity in replenishing the water supply from which your pets can drink from and satisfy their hydration needs. But it has a smaller capacity than many of the fountains in our list, although it’s also ideal for short travels and for short times when you’re away from home. Since the water continuously flows instead of being stagnant in a bowl, your pets will also drink more from it – and we know by now the health benefits of proper hydration. The water is also safe for drinking, thanks to the Microban feature that prevents the growth of bacteria that causes stains, odors, and illnesses. The PetSafe Drinkwell line of water fountains yields another exceptional product – the Original Pet Fountain with its 50-ounce water capacity. But the reservoir can also hold as much as 100 ounces of water, so there’s fewer refills necessary, a convenient feature when you’re traveling or when you’re away from home for longer periods. The electric pump is small yet powerful enough to ensure that as much as 100 ounces of water can be circulated over and over again. The continuous circulation means that two actions happen: first, the water can be oxygenated (i.e., aerated such that oxygen is added); and second, it can be filtered several times. The water free-falling from the spout into the basin is then always safe for drinking, not to mention that it will likely be cool and fresh – and it’s exactly the way your pets like it! The replaceable carbon water filter is made from organic coconut shells, a common design aspect in most Petsafe waterers and fountains. Its main job is in removing the undesirable taste and odors, as well as the contaminants, in the circulating water. The PetSafe Drinkwell Platinum fountain is among the best because it delivers on the three most important factors – reliability in delivery of fresh and clean water to pets; affordability in price; and beauty in overall design. The fact that it comes from a well-known manufacturer of pet-related products is also a plus in its favor. The 168-ounce water capacity is sufficient for 2-3 pets to satisfy their thirst for an entire day. 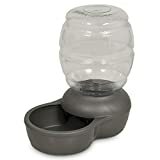 Your pets will also like drinking from it because the free-falling water stream looks, feels and tastes fresh, clean and cool – and you don’t want anything less for them either. You can fill the reservoir nearly to its brim, turn on the motor, and let the fountain do its work. The PetSafe filtration system is also incorporated in it, particularly the replaceable carbon water filter for the elimination of contaminants including the bad smells and tastes of the water. The filter, by the way, is primarily made from coconut shells that have been subjected to carbonization and activation. Tip: If the motor seems to be humming more loudly, you should check if the reservoir has enough water in it. You may have to refill it so that it goes back to its quiet operation. What’s the best dog water fountain for your own pets? You have to decide based on the size, temperaments, and personalities of your pets, especially when they have special needs in hydration. You may have to buy two types of fountains for your pets, but the expense should be well worth the health benefits, particularly in longer lives for them.